Every amateur lawn care expert dreams of growing the perfect lawn, but what is the perfect lawn? 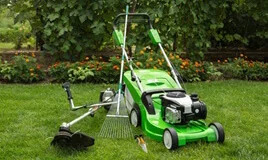 It might be something different depending on where you live and what your own personal experiences with lawn care are. It’s not an easy thing to pin down, but there are some common features most of us would look for including: thick healthy grass, no weeds, lush green color, and neat and tidy edges. If we accept these key features as a starting point it’s easier to define what it takes to create a lawn with all of these things and it turns out you have to commit yourself to a year-round lawn care plan. Creating and managing a year-round lawn care plan takes dedication and commitment. My former neighbour had one of the nicest lawns I’ve ever seen and he spent a lot of time getting it right. He had a regular schedule for applying fertilizer, he had it cut to just the right length, he watered it almost every day, and he was constantly inspecting for weeds. If you want the nicest lawn in the neighbourhood you’ll have to demonstrate the same level of commitment. Don’t get me wrong, you can still have a nice lawn with a less stringent schedule of lawn care than my former neighbour, but it probably won’t be quite as impressive. It’s up to each individual homeowner to decide how much time they want to spend on lawn care, but don’t think you can simply cut your lawn once a week and have a nice lawn – that won’t happen. When we say you need to have a year round plan we’re not kidding. There are things you can do in all four seasons to help you grow a beautiful lawn – including the winter. If you’re still enthusiastically waiting for our year-round lawn care and maintenance tips then read on! Spring is typically seen as a time for renewal and new beginnings. This is the best time to get a jump on your lawn care schedule for the coming year. For each season we’ve come up with four key areas you can focus on to get the most out of your lawn. Here are four key things you can do in the spring to make sure you have the healthiest lawn possible. We might not think about the soil underneath our lawn when we think about lawn care, but we should. If you don’t have healthy rich soil full of nutrients your lawn will fail no matter how much work you put into it. You can buy kits yourself to test the nutrients in your soil such as phosphorous and potassium. Alternatively you can hire a professional to do it for you, but either way it should be tested. There are a few lucky people out there that have amazing photographic memories. These are the type of people that never had to study in school to the consternation of the rest of us and if you fall in this category you’ll probably never have to keep notes on anything in your life. For the rest of us, it’s the only way we can remember things in the long-term. One of the secrets of maintaining a great lawn is to keep notes. You may think you’ll remember what worked last year, but you probably won’t. It’s easier just to write it down for easy reference later. The spring is also the time when you’ll need to pull out that mower for the first cut of the season so you’ll want to make sure you have your height settings right on your mower and everything is in working order. It’s also a good idea to thatch your lawn so that it can breathe. You can use a traditional rake for this or you can use a power rake. It’s also a good time to aerate your soil as well to make sure enough air, water, and nutrients are penetrating the roots of your lawn. The other important thing you should be doing in the spring to help grow a beautiful lawn is applying the right amount and type of fertilizer. Herbicides are great for growth and this should be your focus in the early spring (assuming your jurisdiction allows lawn chemicals). Later in spring once the lawn is starting to fill in nicely you may want to consider applying a weed killer as well. Water is essential to a healthy lawn. It’s simple. If your lawn doesn’t get enough water it will dry out and die. That doesn’t mean you should necessarily water it every day – too much water can be a bad thing as well. It’s important to understand the conditions and make adjustments from there. If you’re in the middle of a hot dry period, you’ll have to water your lawn more than if you would if it’s been raining off and on for a week. As a rule you’ll probably need to water your lawn every 4 or 5 days, but this schedule will have to be adjusted based on the local weather. It’s important to make sure you cut your lawn to a certain length – typically between 2 to 2 ½ inches. This is what you might refer to as the Goldilocks zone. It’s not too tall and it’s not too short. If you cut your grass too short weeds will quickly take over. Higher grass chokes out weeds and it also keeps the soil cooler by blocking some of the heat from the sun. The cooler soil will maintain moisture better helping your lawn to grow. No matter how meticulous you are in following some of the lawn care techniques we’ve already mentioned there’s still a good chance you may run into an insect problem. The little creepy crawlies in your soil don’t care how important a nice lawn is to you and some of them can do a lot of damage to your lawn. It might be necessary to apply some further chemicals that attack these little pests, but always try to stick with the organic ones and only use as much as necessary. Chemical use should always be limited to minimize its impact on the environment. 4. What’s with the Brown Spots? A few years back our lawn was covered with little brown patches and it was more than a little frustrating. At first we thought it was the family dog causing the problem when she was doing her bathroom duties, but our lawn care specialist neighbour soon set us straight. These brown spots can also be caused by a couple of other things including lack of nutrients in those areas of the soil, lack of water, and certain bugs. If you have them, get to the root of the problem first before attempting to find a solution. You want to make sure you’re treating the right problem if it’s going to help your lawn recover. As fall approaches it’s time to start considering what you need to prepare your lawn for the winter ahead. For starters you’ll want to remove any debris such as branches and nuts. You should also considering thatching your lawn again. If you’ve got areas where the grass isn’t growing properly the fall is a good time to throw some seed down or lay some sod in extreme cases. This will give it time to take root early in the spring and give you a jump on the next growing season. If you live in a neighbourhood with a lot of trees it can be a real pain dealing with all those leaves in the fall, but it has to be done. They can do a lot of harm to your lawn and if you don’t rake them up in the fall you might be dealing with a much bigger lawn care issue in the spring. It might surprise you to know that the fall is also a good time to apply some fertilizer to your lawn. While it’s true that your lawn isn’t going to grow through the winter, you still need to make sure that it’s ready to grow in the spring. Try adding a fertilizer rich in potash – this is good for root stability and will ensure your lawn is ready when spring rolls around. Remember those notes you started taking back in the spring? The winter is a great time to review them and think about what you might want to do a little differently next year. You can also look for lawn care books in your local bookstore for some tips from the experts. A little knowledge will serve you well. Taking care or your lawn can be a messy job and your lawn equipment will likely confirm that. The winter is a great time to clean out all the built-up clippings around your mower blade and trimmer blade. It’s also a good time to oil moving parts, check for any parts that may need to be replaced, and make sure your blades are nice and sharp for next year. Most people have a little bit of fuel left in the tank after they cut their lawn for the final time in the fall. Some argue that this is okay and you can simply add more fuel in the spring to give your mower the boost it needs to get going again. Others suggest you should make sure all of the fuel is drained out of your mower in the fall as it tends to degrade when left to sit. The best advice anyone I can give you is to follow the instructions that your lawn mowers manufacturer provides. Each machine may be a little different and it’s best to listen to what they have to say. If you’re not careful, your snow blower can do a lot of damage to your lawn. You worked hard in the spring and summer getting those nice edges around your lawn – don’t blow it now! Take proper care when cleaning the ice and snow from your driveway and walkways. Make sure you know the boundaries of your lawn and if you’re not sure consider using wooden stakes to help you. Also, be careful not to throw salt and de-icing chemicals onto your lawn as you plow. These can do a lot of damage to your lawn as well. Well there you have it. These are our year-round lawn care and maintenance tips for your yard that, if implemented properly, can help make you the envy of all your neighbours. At the beginning of this article we made it clear that there isn’t one perfect lawn that will suit everybody. We all have different expectations and depending on where we live we may be limited in what we can accomplish. It’s a good idea to understand your local climate and soil conditions if you’re going to have the best lawn possible. A lawn in Phoenix Arizona is probably going to look a lot different than one in upstate New York. That doesn’t mean you can’t have a nice lawn – you just have to adjust your expectations accordingly. If you keep all of this in mind and make a commitment to year-round lawn care you will be the envy of your neighbours.